that is otherwise surrounded by a rough, black rock coastline. 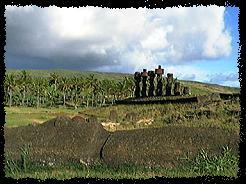 The idyllic setting here is interrupted by an Ahu with six moai, a stark reminder that you are still on Easter Island. The distinct features of the moai, with carvings on their backs, are accented by the red scoria top knots, or pukaos, on their heads. 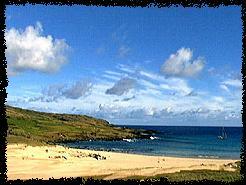 This is where the island's first settlers, Hotu Matu'a and his family, are believed to have landed. (above) Moais at Anakena Beach.